e-Travels is a dedicated Tourist guide, catalog and travel guide for small-medium sized hotels, restaurants and other businesses in Greece. We back this up with our amazing low price guarantee and an innovative referral program for business owners and travelers. 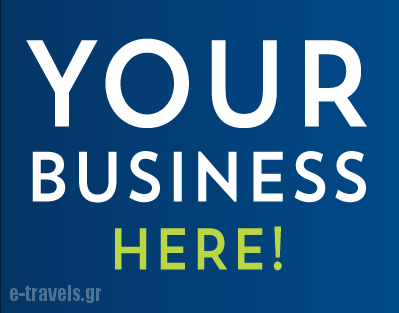 e-Travels Greek Tourist Guide and Directory is the secret to an extraordinary travel experience and with our promotional and marketing services we can help business owners to make the most of their business. Explore how e-Travels works and discover an amazing and unforgettable experience! Chances are e-Travels has a listing for your hotel or restaurant business already. Claim an existing listing or add a new one. If your business has multiple locations or if some of the info is not correct contact us to update your business information. Adding complete information about your business helps you tell the best story about your business. You can add photos of your business & services, hours of operation, services offered and list the various ways customers can reach your business. You can also publish and share an upcoming event to attract more customers. 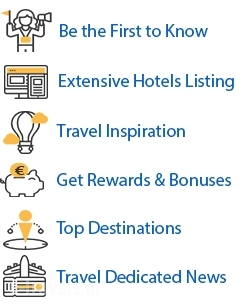 While e-Travels is free for all to use, to get access to more advanced business listing building tools, you can upgrade to e-Travels premium packages. For a small monthly fee, you get (1) business listing features that are previously not available with their free service, and (2) enhanced / improved elements that are not available to their free service users. To grow our community, as well as reward our members for bringing more people into the fold, we also used a referral program. There are no complicated calculations and, unlike other referral programs, we don’t just give you more rewards points. We give you commission fees return, booking and subscription discount coupons that you can immediately apply toward your own hotel, restaurant or other business bookings. Explore our business listing and discover exceptional accommodation and entertainment destination in the Greek islands and mainland. 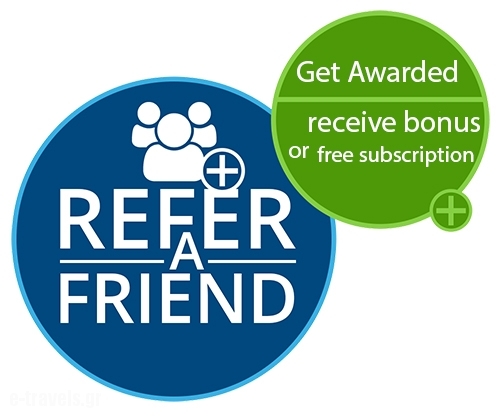 Refer a friend to e-Travels today and earn a variety of bonuses and rewards. When your friend books their first hotel or restaurant via e-Travels, you’ll get discount coupons, booking discounts and other important rewards in your account for your next booking. It’s as simple as that. The more friends that are approved and proceed to an online reservation with e-Travels.gr, the more rewards you can earn. Get rewarded for sharing e-Travels! We’ll give you and your friends discount coupons and rewards when they join and proceed to an online resrvation for any accommodation or restaurant of their choice via e-Travels – our dedicated Tourist guide, catalog and travel guide for the Greek islands and mainland. 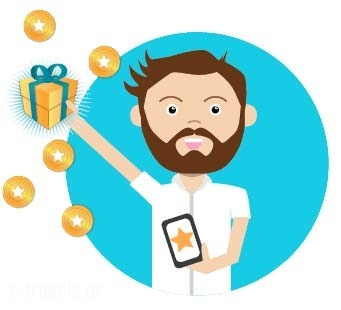 Use your unique referral link or code to invite friends to join e-Travels.gr. Your friends will also receive a discount coupon when they proceed to a reservation via our booking platfor,. You can earn up a wide range of rewards per year. Redeem your rewards at checkout for any gift card.